We are a diversified business model which services all markets in the commercial, industrial and national account arena. As a busy property/facility professional, you have many jobs to juggle as well as vendors to interact with. One of the most important ways to attract and retain tenants in office building or property management settings is to maintain the property’s exterior and curb appeal. The parking lot is the first impression for potential tenants and their customers. 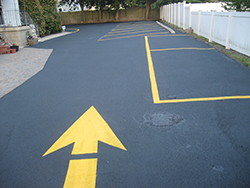 A clean, well-maintained parking lot indicates a professional outlook in all aspects of business and translates into a positive first impression. As a National Facility Management Professional, you are probably finding your portfolio growing, manpower shrinking and never enough hours in the week to get to your entire task list. With this being the case, you may be tempted to opt for a National Service Provider relationship to simplify your property maintenance/pavement management. If you have opted to go this route in the past, you probably have been disappointed with the results of what was sold as “hassle free” service. We currently self-perform all contracts our company sells in NJ, PA, DE, MD & VA with extended service into New England and Georgia. One of the most important aspects of maintaining a community’s home values and attracting tenants in a residential community or apartment complex is appearance and the curb appeal of the property. Residents want to live in a clean, well-maintained area and this includes the parking lots and roadways – especially when these residents are paying condo or management dues. Preventive Maintenance Plan. 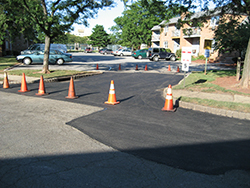 Our exclusive Preventive Maintenance Plan provides you with a comprehensive tool to identify current pavement and concrete issues as well as helping to establish a budget for asphalt and concrete needs. Presenting this tool to the board of an association allows the entire group to see a full analysis of the pavement and concrete, and helps to plan for capital needs in upcoming years. Avoid being blind-sided by capital projects arising without planning by the board. Golf and Tennis Clubs appeal to a certain clientele. This same clientele comes to expect an appealing property when used for their own recreation and to entertain clients, family and friends. 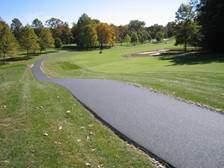 Smooth and maintained cart paths, parking lots and access roads that are free of asphalt defects and seal coated to always maintain a fresh and welcoming look! Furthermore, when work is being completed on the property, while members adhere to a dress and conduct code, you may be surprised to see most paving and concrete companies may not share the same vision for professionalism. Our crews are uniformed, professional and courteous of your members and guests. Our work sites are staffed with professional project managers who are accustomed to interacting with a more affluent clientele, along with support services such as portable bathrooms to maintain professionalism from start to finish with an understanding regarding the privacy your members/guests have come to expect with minimal disruption to their recreational activities. Health care & hospital facility managers not only face the same resource constraints as in other industries, but also the principal focus of patient safety and compliance with ADA, USAF and other requirements. 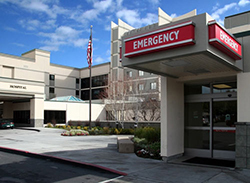 Hospitals and health care facilities are some of the most complex buildings to manage because of the wide variety of functions within one facility. Parking lots and roadways are an important aspect of the facility’s value and appearance of the grounds as a whole. Whether you manage one hospital or twenty five properties in a heath care group/affiliation, we can help you manage your entire pavement management plan. Preventative maintenance is an important part of a capital asset program for healthcare and hospital facilities. 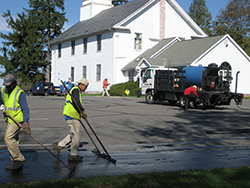 We apply pavement sealers that are ready for traffic in as little as 1 hour for emergency rooms, urgent care facilities and other high traffic/on-demand areas of your facility that cannot be closed to traffic for 24 hours. 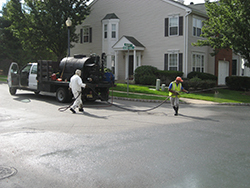 In addition, we offer environmentally-friendly products that are conducive to a healthcare facility project, such as alternatives to coal tar emulsion pavement sealers (which emit fumes that could aggravate patients and visitors to your facility). 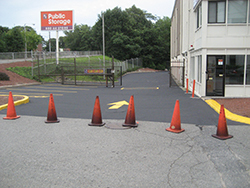 We can help you design a pavement management program to manage your entire portfolio of properties. Our Past/Present Industry Affiliations Include: International Facility Management Association (IFMA), and the Building Owners and Managers Association (BOMA). The offerings to churches and other places of worship are no doubt affected by the slower economy. For this reason, some institutions have deferred preventative and structural maintenance services due to a shrinking budget. Unfortunately, as time goes on, the smaller problems in your parking lots turn into larger more costly problems. Some churches have organized maintenance committees, which is a great start. More importantly, these committees need solid budget numbers to make informed maintenance/purchasing decisions to make sure small problems that could be repaired on a “payment plan” are not left alone to turn into more costly repairs the following season. If you are an owner/manager of a single commercial/industrial property that is in need of paving, concrete or pavement maintenance services, you have found the right company. If your search through the yellow pages or internet has left you disappointed in the professionalism of the companies who have responded or you are suspect of their “high pressure — you must buy today” sales tactics, rest assured that interacting with our company is a night and day difference. When contacting our firm, you will be dealing with a first class professional organization that has serviced the largest Fortune 500 companies and national retailers in the country. You can expect straightforward pricing in an easy-to-understand menu format which will guide you in the right direction for choosing the properly engineered service for your particular project. Our company employs an account manager who deals directly with single contract property owners to help better assist them in making a more informed purchase decision and avoid the scams perpetrated by unscrupulous asphalt contractors who target both residential and single property owner commercial properties with “high pressure” sales tactics and “bait & switch” scams backed by unprofessionalism, poor customer service and zero follow-up for punch list items.